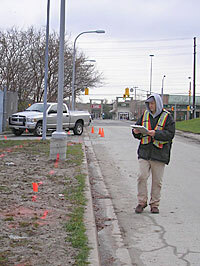 ClearView can locate many utilities using its multi-frequency pipe & cable locating system. We have experience in locating a variety of underground facilities, both indoor and outdoor. Pipes, cables, wires, conduits along with major underground facilities such as, hydro cables, telephone, secondary gas, water, sewer (storm and sanitary) and communication cables. The system consists of transmitter and receiver units. The transmitter can be grounded directly to a pipe so that the receiver can trace an applied signal. Where cables or pipes are not accessible, the transmitter unit can be placed over their suspected locations so that a signal can be induced for tracing. This can be used to complement other methods (e.g., EM31, EM61) used to detect underground storage tanks (USTs). The transmitter is connected to vent/fill piping and the potential UST is energized for detection. For tracing non-conducting utilities such as sewers or non-metallic piping, standard practice is to mark piping directions at the catch basin, manhole or exit points. More definitive locates can be done by inserting an energized sonde through the piping and tracing the signal along the ground surface. Methods such as Electromagnetics (EM) or Ground Penetrating Radar (GPR) may also be applicable for tracing utilities such as sewers or piping (e.g., PVC). Work can be carried as per ASCE Standard CI/ASCE 38-02 used as a guidleline. This standard outlines collection and depiction methods for existing subsurface utility data. ClearView provides private locates and is not affiliated with One-Call.